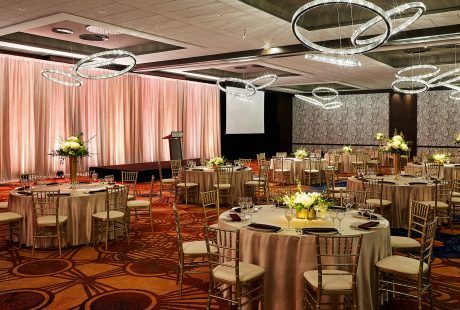 The Westin Cleveland Downtown: A classic or contemporary-styled venue that allows for up to 600 guests in their 9,000 square foot grand ballroom. The Westin has fabulous hotel deals, overnight parking garages nearby, valet parking and on-site food & drink catering. The Westin is also home to one of the best Cleveland Restaurants in town: The Urban Farmer. 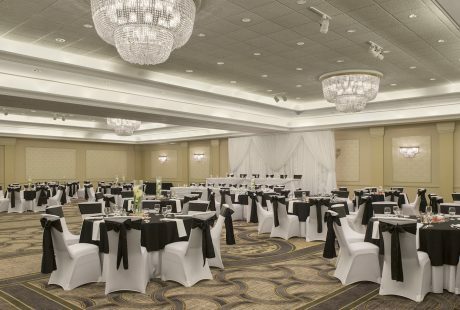 Sheraton Suites Akron/Cuyahoga Falls: Their beautiful riverfront ballroom holds up to 500 guests and has skilled on-site culinary teams that create diverse menus for any event. Close to the Akron/Canton airport, guests can arrive with ease and luxury hotel packages are available. The Bertram Inn Aurora, Ohio: The Bertram provides planners who take care of every detail of the event for you. From choosing color palettes to deciding what h’ordeuvres to serve, their service is outstanding. 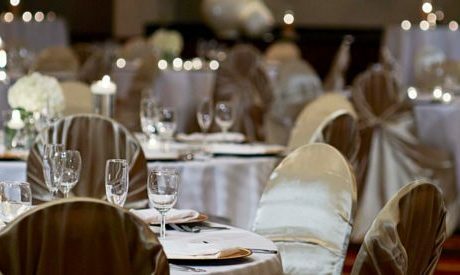 They offer three different size ballrooms to choose from, one of which (The Hayes Ballroom) is in the annex building to the main hotel giving you hotel service, but in a very private space. On-site catering of food & beverages help narrow down what menu you would like to serve. The facility provides wedding & event hotel packages and has a large parking area. The 9: Metropolitan Hotel Downtown Cleveland: Unique, luxurious and romantic are just a few words that describe the style of The 9. Their MINT Ballroom is a flexible space that can be altered to your party size. In addition, the Vault is just steps away with even more flexible party options. 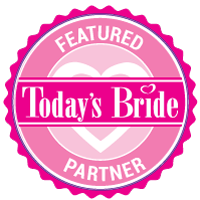 Personalized wedding planners are readily available and they provide wedding hotel packages for guests. Parking lots are located under and next to the building as well as on-site valet services. 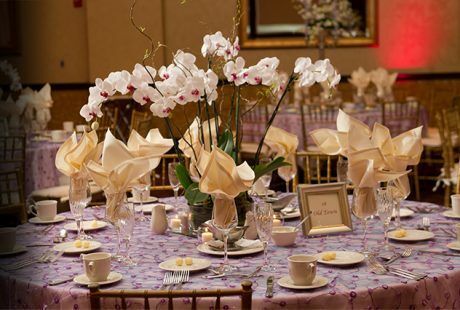 Cleveland Marriott East: The Marriott provides elegance in their 7,000+ square foot ballroom that fits up to 700 guests. Excellent hotel packages are provided for guests as well as on-site parking, catering and wedding planner services. So what’s next after the venue? The music of course! View our DJs & musicians now and let us know who you’d like to perform at your event. 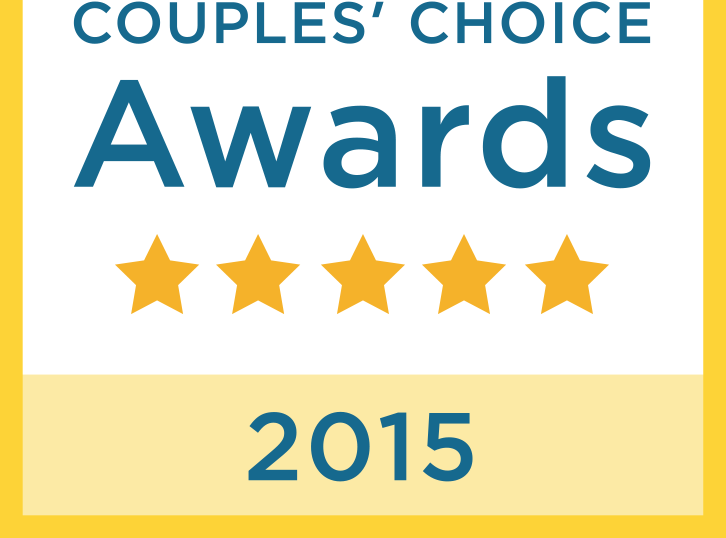 Visit our Preferred Cleveland Vendors page for a list of our favorite local venues.